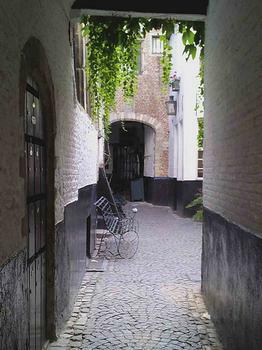 The Vlaeykensgang is a hidden medieval street near the Cathedral connecting Hoogstraat, Oude Koornmarkt and Pelgrimsstraat. The Vlaeykensgang is a hidden medieval street near the Cathedral connecting Hoogstraat, Oude Koornmarkt and Pelgrimsstraat. Step back in time behind the door of the narrow cobblestone alley on Oude Koornmarkt 16, and admire the quaint 15th - 16th century buildings. The Axel Vervoordt Gallery and some restaurants can be found on this 1 metre wide alley.